Silk laminate coating is a fairly new technology advancement in the field of design and print. It was developed to increase the appeal of printed material, as well as the durability. 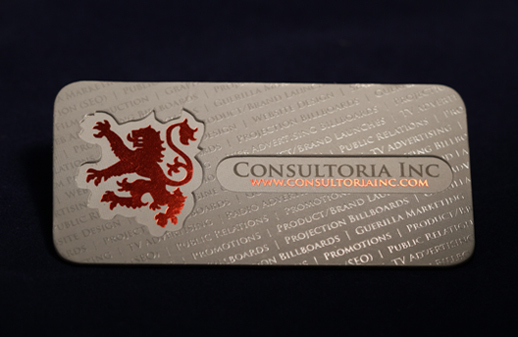 Silk business cards are much more attractive than the generic gloss or matte finish applied to most printed pieces. Taste of Ink specializes in utilizing the infinite capabilities inherent to silk laminated business card technology to produce the finest printed marketing materials. The process begins with selecting a heavy card stock (10, 12, 14 or 16pt stock) to work with. 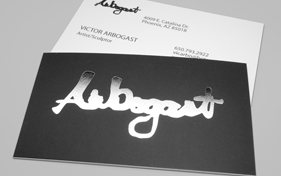 Heavier stocks tend to produce dramatically thicker business cards when the silk/satin laminate coating is applied. 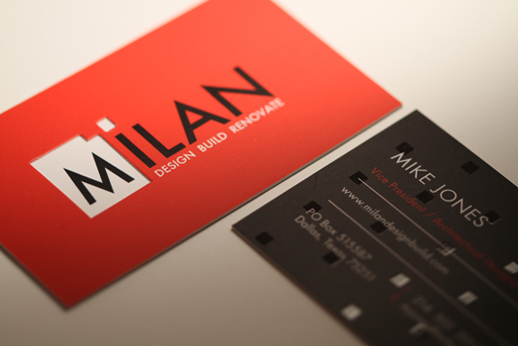 The cards are cut with a laser die-cutting machine to specified dimensions. This is also where any unique shapes or holes are punched out of the card stock. Once the design has been printed in full 4/4 color ink, the silk coating is applied. 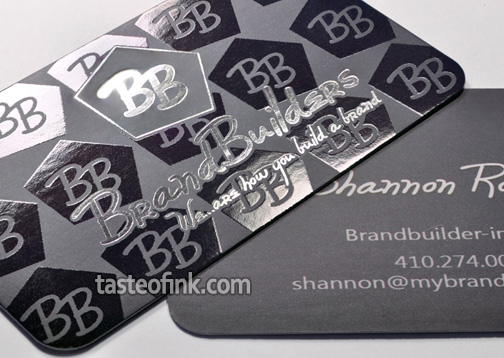 Any custom enhancements are added, including spot gloss UV highlights and decorative color foil stamps. 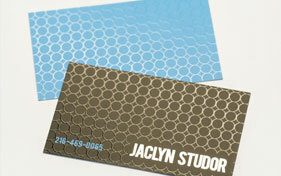 Silk laminate produces a very rich, thick effect when applied to a good quality business card stock. They tend to feel very silky and smooth to the touch. 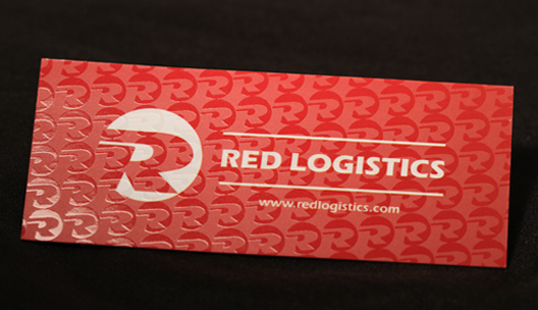 Silk business cards are much more likely to impress prospective customers than traditional plain matte-finish cards. They give off a distinguished elegance that will convince even the most skeptical consumer that your business is legitimate and top-notch. 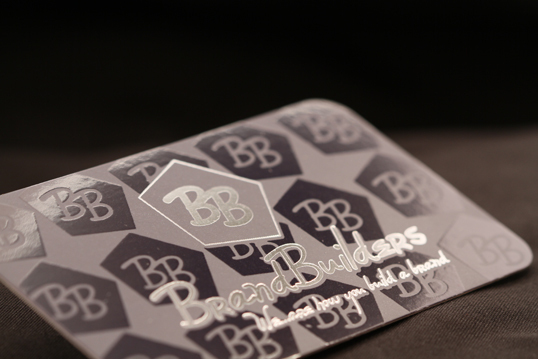 When combined with custom upgrades like spot gloss, die cuts, and decorative foil, silk business cards will separate you from the other boring business cards in circulation. 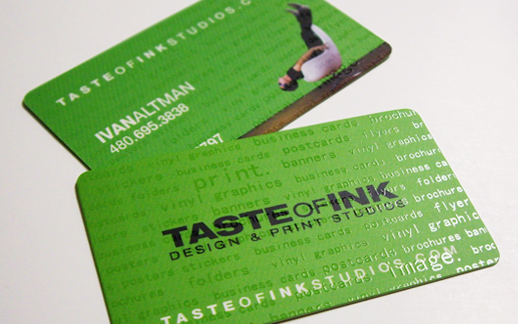 Taste of Ink makes ordering your custom silk business cards a simple process. 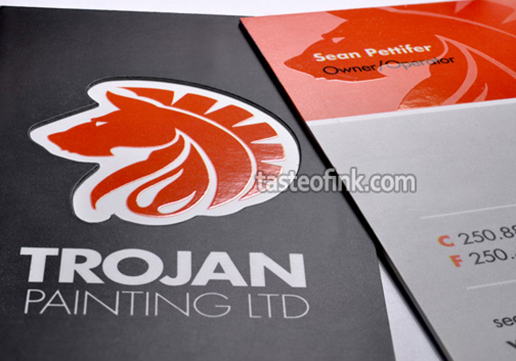 Our design and print specialists will work with you in creating a unique and classy business card that will define your company image perfectly. Order our print sample packet to get a better idea of what custom enhancements are best for your business card design. Visit our Help and Support Page to contact a designer and get started today.